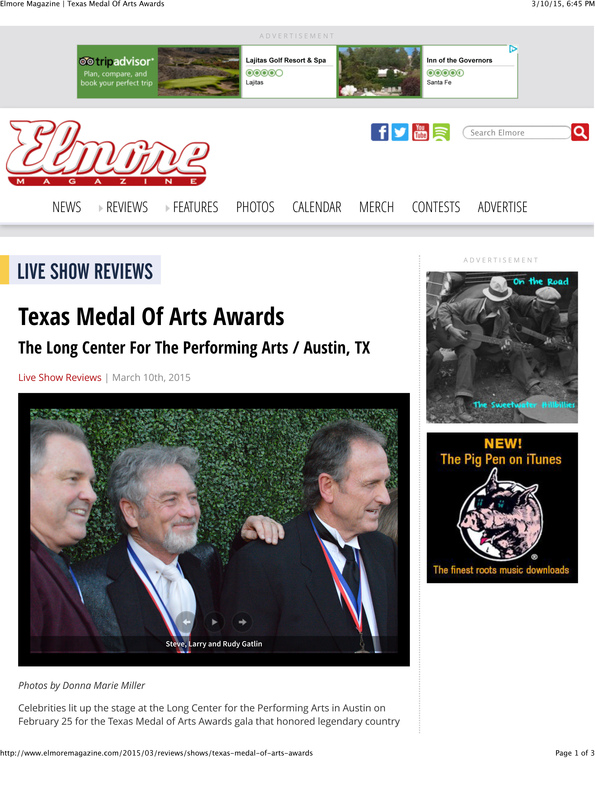 Celebrities lit up the stage at the Long Center for the Performing Arts in Austin Feb. 25 for the Texas Medal of Arts Awards gala that honored legendary country performers The Gatlin Brothers among others. Texas Cultural Trust provided a lifetime achievement award to The Gatlin Brothers, Larry, Steve and Rudy Gatlin for their musical career that spans nearly 60 years. Proceeds from the eighth biennial event will fund arts programs administered by the trust. The three young Gatlin brothers began at two, four and six years old singing gospel music together on The Slim Willet Show broadcast live on KRBC-TV from Abilene and they eventually recorded 28 albums together. 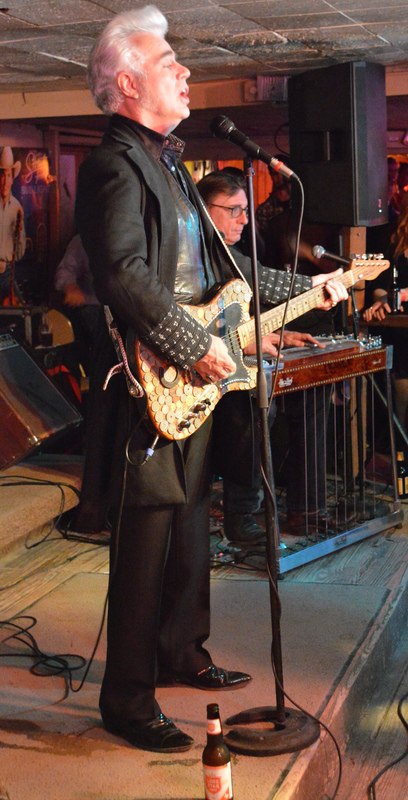 Larry began his career in Nashville by writing songs recorded by country stars Johnny Cash, Kris Kristofferson, and Elvis Presley to name a few. His brothers soon joined him to record two solo albums on Monument Records, The Pilgrim in 1974 and 1975’s Rain Rainbow. After receiving a Grammy award and being inducted into the Grand Ole Opry, the brothers officially became a trio in 1979 to release their debut album, High Time, and signed with Columbia Records. He later wrote 34 top 40 hits for the group including eight number ones over the course of their long career, as the Gatlin Brothers lit up marquees and packed hundreds of music halls across America before their tours halted in 1992. Currently, the Gatlin Brothers’ 60th Anniversary Tour has scheduled appearances from Nashville all the way to the West Coast by May and back through Texas before it ends in Virginia this November. Blues, rock and pop legend Steven Haworth “Steve” Miller presented the Gatlins with their award while a montage of home videos and vintage photos displayed on a screen at the back of the stage. Images of the three brothers and their younger sister, LaDonna, dressed in western wear and cowboy hats appeared while their song famous “Swing Down Chariot” played. The Gatlin Brothers together with their bass player Steve Smith, afterwards performed “All the Gold in California,” a number one hit that stayed on Billboard magazine’s Hot County Singles chart for ten weeks in 1979. The audience enthusiastically contributed to the familiar chorus. Steve Gatlin said growing up in West Texas their parents taught the boys Christian values and demonstrated a strong work ethic. He attributed their music education in whole harmony structure, phrasing and enunciation, to Texas elementary schools. “I had wonderfully gifted choral directors – many — from elementary school through college that inspired me with all the genres of music and opened up a world to me that I didn’t know existed,” Steve said. Rudy also thanked the Texas Cultural Trust for honoring the siblings. “We’ve had a wonderful life. We’ve been blessed,” he said. Mentioning fellow Texans and Country Hall of Famers Willie Nelson, Kris Kristofferson, Mickey Newbury and Roger Miller, Larry also praised his former senior high school teacher, Ann Louise Jones and English professor Dr. Charles Beatty at the University of Houston. “Those little songs about doggies and horses that I wrote for us and we recorded, I owe to those people who engendered and fostered a love in me for words,” Larry said. The Gatlin Brothers also performed their 1986 song, “Texas (is What Life’s All About)” that Larry composed together with Lance Legault for the Partners album. Also recognized at the Texas Medal of Arts Awards were: T. Bone Burnett from Fort Worth, for his 40 years of experience in the music and entertainment business; Jamie Foxx from Terrell for his work as a comedian, film actor and musician; the Kilgore College Rangerettes of Kilgore for pioneering the field of dance drill teams; and Rick Lowe, of Houston for his national and international visual arts projects. Other honorees included Dr. Pepper Snapple Group from Plano as a corporate arts patron; Margaret McDermott of Dallas as an individual arts patron; Emilio Nicolas of San Antonio, as a founding pioneer of Spanish language television in the United States; and Dan Rather from Wharton, for his more than 60 years covering major news events. Additional awards went to Charles Renfro from Houston, for his architectural design; Robert Schenkkan, from Austin, for his work as a writer for theatre, film and television; Booker T. Washington High School for the Performing & Visual Arts in Dallas, for its arts education programs; Lawrence Wright, of Austin, for his contributions to the literary arts; Chandra Wilson from Houston, for her career in television, film and on Broadway; and Ruth Altshuler from Dallas who received the Standing Ovation award for her philanthropic and charitable contributions. Hosted by four-time National Football Conference Champion former Cowboy quarterback Troy Aikman and seven-time Emmy Award winning veteran anchor of FOX sports, Joe Buck, the elite event included a star-studded cast of celebrities. 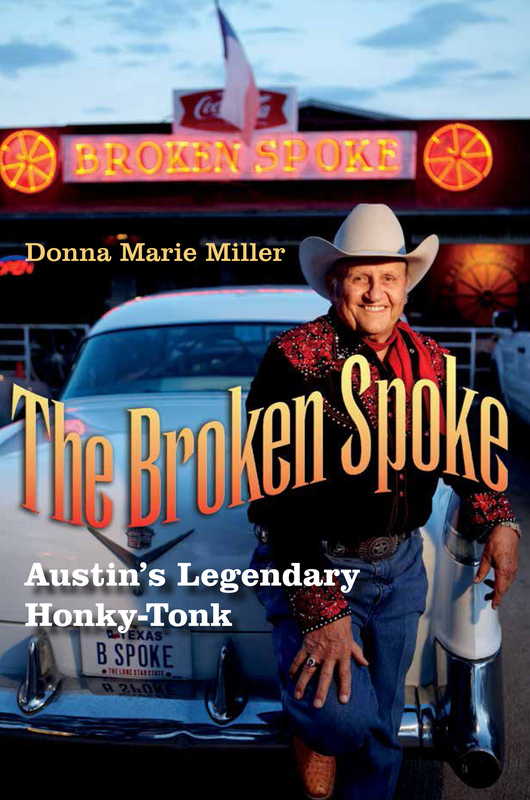 Presenters included Steve Miller, former First Lady Laura Bush, and Asleep at the Wheel frontman, Ray Benson. Honorary chairs included Texas Governor Gregg Abbott, Lt. Gov. Dan Patrick and House Speaker Joe Straus. Attendees included Cowboys owner Jerry Jones and businessman H. Ross Perot who ran unsuccessfully in 1992 and 1996 for the U.S. presidency as an independent candidate.